Papilloedema is a swelling of the optic disc that occurs as a result of elevated intracranial pressure (ICP). The condition is usually bilateral, although one eye may be more severe in presentation than the other. 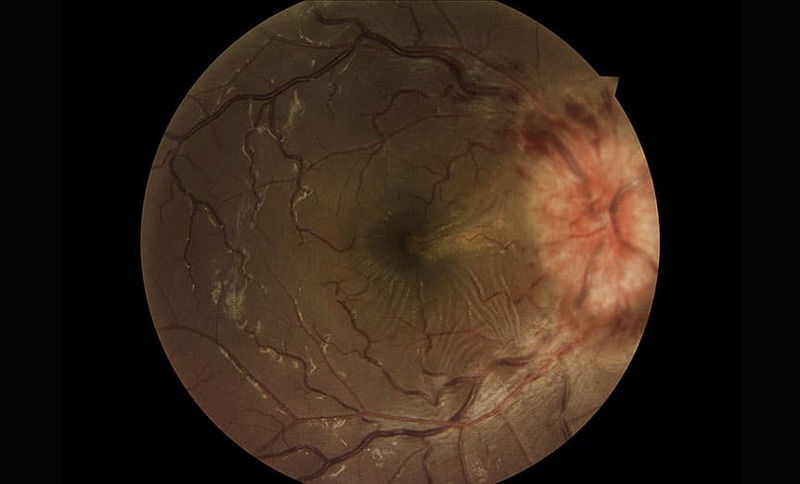 Patients may present with classic signs, including blurred / indistinct and elevated disc margins, disc pallor, as well as retinal haemorrhages, engorged blood vessels and choroidal folds. Pulsatile tinnitus (a rhythmic pulsing noise in the ear). Papilloedema is caused by a disturbance or disruption to axoplasmic flow, causing stasis at the optic nerve head. Build up of ICP behind the optic nerve causes an imbalance, which leads to oedema of the optic nerve. If elevated ICP is not treated or lowered, this can eventually cause optic atrophy and permanent effects on vision. In the absence of increased ICP, disc swelling is termed optic disc oedema rather than papilloedema. Any presentation of papilloedema in a primary eye care setting should be immediately referred for urgent emergency tertiary care so that further investigation can be conducted. Once all primary underlying conditions are excluded through examination, IIH can then be diagnosed (i.e. diagnosis of exclusion). Papilloedema resolves upon treatment or resolution of the underlying cause. Treatment of IIH is aimed at lowering ICP. Methods include lumbar puncture, prescription of diuretics and weight loss management. If ICP is effectively lowered in a timely manner, visual prognosis for cases of IIH is generally good.